Very few in Nosgoth know the origin of the Pillars; the Ancients who constructed them have disappeared without a trace. But their legacy lives on. The nine Pillars, each representing an individual aspect of the land’s magical spectrum, form a spiritual bond with humans of their choosing as they are born. For these nine humans, immortality and incredible dominion over magic are imbued, as is the role of Guardian of the land. Since the Pillars have existed, nine guardians have existed, the Protectors of Hope. Their magic is used to defend and maintain the balance and stability of the world. If one guardian is killed in this duty, the Pillar instantly culls a successor, as one dies; another is created to take their place. 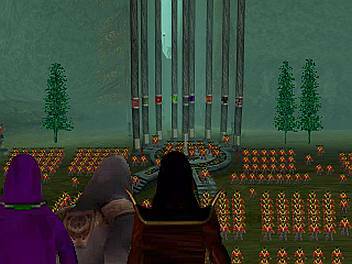 When Ariel, the guardian of balance was killed, Kain was born as her replacement. Nupraptor, Ariel’s lover and guardian of the pillar of the mind, descended into madness, and his link to the other guardians caused this to spread into them as plague of deranged insanity. In a short time, the entire group of sorcerers had gone from protectors to destroyers. 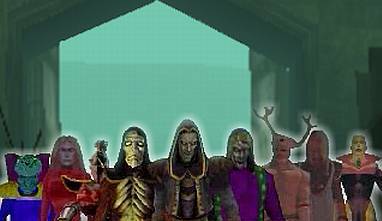 In Blood Omen: Legacy of Kain™, Kain hunted down and murdered the eight sorcerers, and upon discovering he was the ninth, was forced with a choice. Should he choose to sacrifice himself to heal the world, the entire vampire race would be extinct. But if he chose to preserve the vampire race, the world would be forced to endure a slow, lingering death. He chose the latter, and opted to rule a dying world. The events of Soul Reaver 2™ have rewritten much of Nosgoth’s history and destiny however. When Kain chose to spare Raziel from the reaver, an alternate timeline was formed. Early events in Legacy of Turelzevir : Doll Reaver™ rectify this paradox. As Moebius shows to his fellow guardians the rewards the Dark Forces bestowed upon him (the Death Star, the Clone Army and Darth Vader), Turelzevir appears and proceeds to provoke everyone with childish insults. As the Clone Army run towards him to destroy, and as the Circle of Nine run towards him with the same aim, the Death Star also fires from on high to eradicate him. The Clones survived the blast, as fully-armed-and-operational-battle-stations are not one of the official vampiric weaknesses. Turelzevir survived, having earned a thick vampiric skin from his heritage. Moebius and Darth Vader survived, both out of concern that someone may try and turn the Death Star against them, invested in asbestos underwear. Mortanius survived through sheer strength of will, and Malek survived, his armour scorched but not seriously damaged. The rest of the Circle of Nine Ariel, Nupraptor, Anacrothe, Bane, Dejoule and Azimuth are, once again, dead. Mortanius’ fate will be decided in the inevitable confrontation with his once apprentice, the Dark Lord of the Sarafan, Sarafan Lord. When the young Kain and Mortanius break into the Super Sarafan Destroyer to rescue Umah from the cells, the Sarafan Lord and his forces discover them, and a battle begins from which one will not survive. Malek’s destiny is a later chapter in Legacy of Turelzevir : Doll Reaver™, in trying to rescue the carbonite-frozen Vorador from Malek’s Palace, a confrontation begins between him and the young Kain.